All of us look to ensure that our lawns retain their beautiful appearance. There is nothing more relaxing than the sight of a beautiful lawn to make all the fatigue of the day wash away. However, to ensure that the beauty of your lawn is not hampered, a bit of work is required. Attention needs to be paid to its maintenance, and one of the major aspects of lawn care is watering. The watering needs to be just right with the right manner and frequency used. A lawn sprinkler system is used for this purpose. We are going to shed some light on the lawn sprinkler options that you have and the things that you need to keep in mind while watering your lawn. This is the era of technology where maximum feasibility is attained in every task, and irrigation of the lawn is no different in this regard. You have two options of irrigation. One is the manual irrigation with hoses, nozzles, and sprinklers which is the traditional irrigation system, and the other is the automatic sprinkler system. Needless to say, these days, it is the automatic irrigation which people prefer to use. Manual irrigation is time-consuming and requires quite a bit of work on your part. You also need to be vigilant if it is manual irrigation that you opt for. On the other hand, the automatic irrigation system does not involve any hard work for you. All that you need to do is turn it on and leave it to perform its task. However, as appealing and convenient an automatic lawn sprinkler sounds, it is essential to understand that it is not suited for every situation. There are some factors that you ought to pay heed to which would enable you to decide which lawn sprinkler system you ought to opt for. The first important factor is that of budget. Do you have the financial means to afford an automatic system and pay for its maintenance and other related costs? An automatic lawn sprinkler would cost quite a bit and then there is the cost of installation that you would have to think about. Maintaining it would not be cheap either, and there is also the additional water cost that needs to be paid heed to. 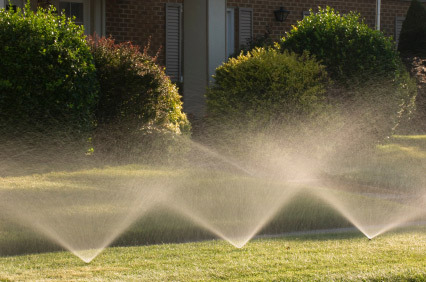 You should only opt for an automatic lawn sprinkler if you are confident that you will be able to afford all its expenses. The next important factor to be taken into account is the landscape of the area. Automatic lawn sprinklers do not suit all types of landscapes. For instance, if you have a small yard, an automatic system would be a bit too much. A landscape that does not require much watering is another one that would not benefit from an automatic system. Automatic lawn sprinklers are more suited for the moderate and large sized landscapes which would take up a lot of time if you attempt to irrigate them manually. Lastly, you should think about your own physical condition while contemplating which irrigation system to opt for. If you think that dragging sprinklers and hoses would be a lot of work for you that you would not be able to manage, it is the automatic system that you ought to opt for. If you have decided that it is the automatic irrigation system that you want to opt for, the next decision that needs to be made is with regards to the type of lawn sprinkler that you want to use. While selecting a sprinkler, it is advisable to opt for something that would send large drops of water in close vicinity to the ground. It has been seen that these sprinklers prove to be more efficient than sprinklers which spray a fine mist and, thus, lose a lot of water due to evaporation. Drip irrigation is what is more suited for trees, shrubs and groundcovers. By getting yourself a proper watering system, you can ensure that over watering is not a problem that you have to face, which not only harms your plants but also proves to be a waste. Above ground sprays can be used for the purpose of watering dense plantings in a thorough manner. You also have the option of customizing the watering system by attaching soaker hoses to solid hoses, which prevents water wastage. 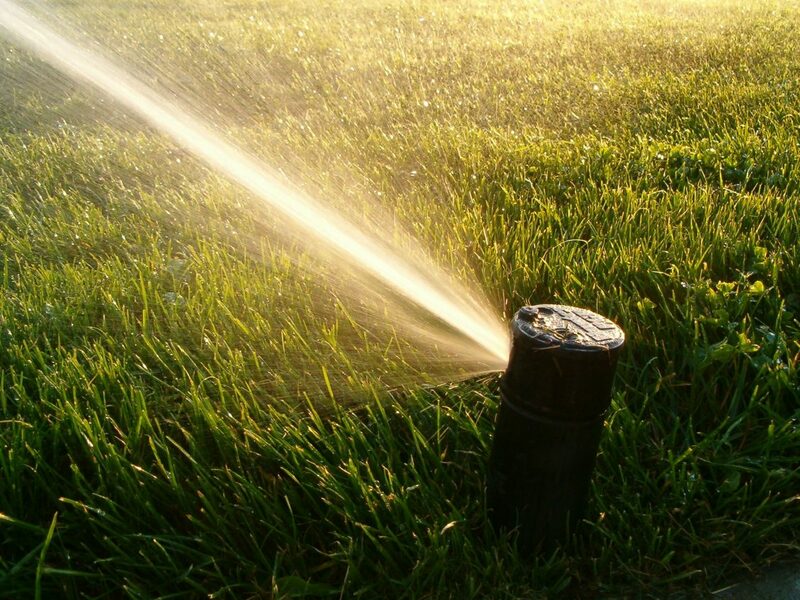 It is prudent to understand that lawns and gardens have specific needs of irrigation, so the approach you adopt should be in line with the requirement of the area. Sprinkler irrigation is a method commonly used for the purpose of watering lawns and other large areas. They are designed to utilize a large volume of water which is stored in the soil. To use sprinkler irrigation in an effective manner, you need to ensure that you have precise calibration which would cover the area effectively since over usage can lead to the occurrence of lawn diseases. It is drip irrigation which is found to be the most water-efficient way to water your lawn. The water is applied at a slow speed that slows down the speed of the soil for absorbing water, thereby ensuring that runoff does not occur. It uses significantly less amount of water as compared to overhead spray devices. It also proves to be efficient when it comes to delivering water to specific areas. If the drip sprinkler is installed in a proper manner, it can be ensured that the water is delivered directly to the soil around the roots of the plants. With the drip system, you do not have to think about the water waste due to runoff or evaporation. However, this form of sprinkler system is not without fault. To irrigate a lawn or another large area, you would need to make use of quite long sections of drip line. You might also need a water pump or additional piping installed to ensure that enough pressure is maintained throughout the drip line system. Tripping hazard is also something that needs to be thought about. Therefore, the type of lawn sprinkler system that would be suited for you should be decided after carefully weighing all your options and studying your lawn in an objective and thorough manner. Simply installing the right lawn sprinkler would not be sufficient. You also need to ensure that you use it effectively. Watering your lawn at the wrong time of the day would not prove to be beneficial and would only end up wasting water while your grass suffers from dehydration. The best time of the day during which you should water the lawn is the coolest parts when the wind is light. While deciding the time of watering, you also need to take the type of grass you have in your lawn and the characteristics of your lawn into account. 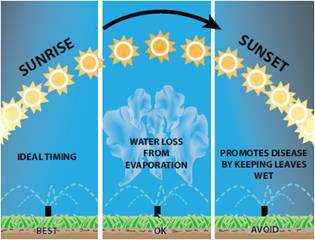 The best time to water is usually at that point in the day when the air temperature is low and dew is present on the ground. The temperatures are lowest either during the early morning period or in late evenings. Watering your lawn when there is a forecast of cool weather ensures that the amount of water your lawn needs is reduced. If you water when the grass is wet, the grass would be moist for a lesser duration which would, in turn, prevent the spread of lawn diseases. Watering on windy days leads to an increased rate of evaporation before the water can be absorbed into the soil. Winds are usually lower in the early morning, which is why watering during this time ensures that lesser amount of water is lost to evaporation. In the evening and morning, the relative humidity in the air is high as the temperature is low, which decreases the amount of water vapor that the air can hold. This is another reason due to which you should water your lawn when the temperature is low. It is apparent that watering in the early morning or late evening leads to reduced wastage of water, which proves to be economical. It also ensures that you have to use less water, which paves the way for a reduced amount of soil nutrients being subjected to leaching. Some considerations need to be kept in mind while deciding the best time for watering. Warm season grasses tend to witness optimal growth during summer and grow best when they are watered less frequently with more water. They need to be watered once or twice a week. On the other hand, cool grasses have a shallow root system due to which they need water at least three times a week. How much and how often to water the lawn? The simple answer to this question would be that you should water according to the requirement of your lawn. When the soil dries out, the grass starts wilting, which then changes color. The roots of the grass are quite long, which is why deep watering needs to be done once every week. This ensures that the moisture and water reach deep into the soil. Deep watering done once a week tends to take around 2 to 3 hours as the water is soaked deep into the soil. 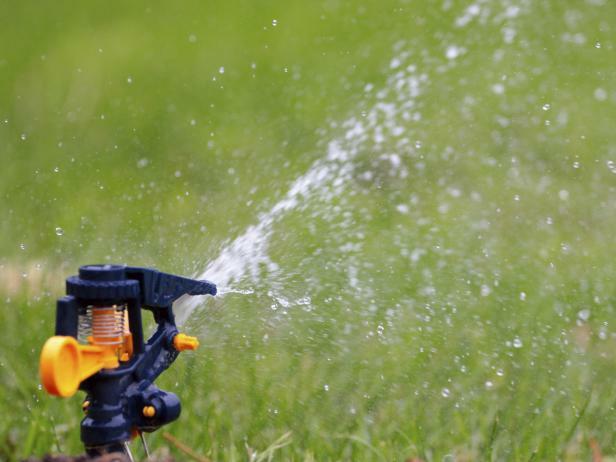 It is seen that on an average, a lawn sprinkler under normal pressure would need to work for 2 hours to deliver one inch of water on the lawn. You should acquire an understanding of how much water your sprinkler is capable of putting out. Many people end up watering their lawns lightly every day. This approach has more disadvantages than benefits to offer. For one thing, it leads to an increased usage of water. It also paves the way for the development of the shallow root system in the lawn and leads to the speedy drying out of the area. The problem of soil compaction also develops as a result. You might also have to face the problem of salt buildup in your lawn due to the movement of water through the soil. To formulate a proper watering schedule, you need to study your lawn carefully. You need to pay attention to decipher how your lawn reacts to the watering schedule that you have adopted. This will let you know the changes that need to be made. You should find out the kind of soil that is present in your lawn. At the same time, check how much water needs to be applied and how long it takes to apply one gallon of water. You should then make adjustments to apply enough water to your lawn according to the weather and the grass type. Remember to water deeply and thoroughly. Lawns usually need at least 1 to 1 and a half inches of water in a week throughout the year including during winter. If the lawns are dry during winter, they are more culpable to sustain damage during the period. The next question that comes up is about how much you should water to get one inch. This depends on the type of sprinkler you use and the water pressure that is maintained. Automatic sprinklers usually take an hour, which it would need to measure you and what you can do by using a tuna can and placing it in the area of the hit of your sprinkler. Run the sprinkler and measure the time that it takes for the water to get a half inch. You should keep in mind that if the weather is extremely hot, the frequency of watering would need to be increased to deal with the problems of evaporation along with heat stress placed on grass. It is advisable to opt for daily watering in such conditions in addition to the deep watering that is done twice or thrice a week. Therefore, the desirable approach would be to water deeply 2 to 3 times in a week instead of daily. This will make your lawn stronger and drought resistant. You can check to see if your lawn is being watered enough by attempting to push a screwdriver into it. If you can’t push it in, watering is not sufficient. Keep in mind that the amount of water a lawn requires depends on the type of soil that it has. The soil is not of a single type but would instead be a combination of clay and sand. A sandy soil would be unable to hold moisture, while a clayish soil would hold moisture better. Water is slow to penetrate in a clayish soil. To decipher the type of soil that your lawn has, you should get a moist handful of it and squeeze it. Clayish soil would form a ball that would not fall apart, while the sandy soil would not be able to stick together. While watering, you should ensure that you do not water for so long that it ends up running down the street. If the water runs down the street before the desired amount is delivered to the grass, you should turn the water off and wait it is soaked in before going ahead. This usually happens when you haven’t watered the lawn for a while. If this is a problem that you face every time, two scenarios are possible. You are either waiting for too long periods between watering or there is a compaction problem. Aeration may relieve this problem, but to attain a permanent solution to the problem, you would need to change the conditions which led to compaction. Application of an environment-friendly liquid aeration can prove to be beneficial in this regard. If you make use of an automatic lawn sprinkler, you should check it on a regular basis to ensure that complete coverage is being attained. If an area fails to respond to watering, you should look for another problem. If the sprinkler coverage is sufficient, the problem might be the development of fungus, Spring Dead Spot, chinch bugs, construction debris buried a foot under the soil and similar other problems. You might want to seek the assistance of a professional in this case who would be able to take a look and let you know where the problem lies. If it is lawn care that we talk about, it is of utmost importance that you ensure that water conservation is observed. You can make use a few tips to ensure that no water is wasted and your lawn gets optimal water delivered to it. For one thing, you need to select the irrigation system with utmost care. The sprinkler system you select should be in line with the kind of lawn that you have. 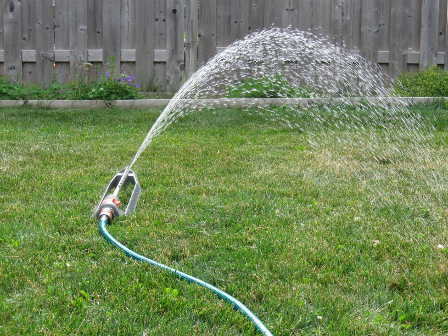 If you have small lawns, the hose end sprinkler would prove to be a better choice. Make use of a timer to ensure that you remember to turn the sprinkler off and do not end up overwatering the area. If you have inground irrigation systems, make use of low volume low angle sprinklers that are equipped with heads suitable for the size of the area that you need to water. The angle heads should be kept as low as possible. This serves to minimize water loss due to evaporation. If you see a fog or fine mist, you should understand that the system pressure is too high. The rotary nozzles available in the market serve to apply water slowly and in an even manner. It is advisable to monitor the watering and observe the water distribution. This needs to be done to ensure that you are not watering hard surfaces that would cause runoff. Creation of puddles in the lawn due to too much water also needs to be prevented. 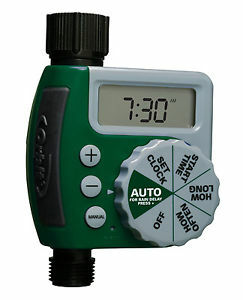 You should use the irrigation system with a timer. You can make use of a smart timer that would adjust irrigation according to the local weather conditions, taking rainfall, temperature, and evaporation rate into account. Water before sunrise as this serves to minimize evaporation and allows you to take full benefit of the calm winds. Time your irrigation period in such a way that it happens when there is no high water usage in your household. Night time irrigation should be avoided to prevent the development of lawn diseases. To ensure that your lawn continues to look beautiful and does not suffer from any damage, you would need to pay adequate attention to it. Watering is an integral part of lawn care and therefore, you need to make it certain that you get it right. It is due to this reason that so much attention needs to be paid while selecting the lawn sprinkler. You need to ensure that the lawn sprinkler you select is suitable for your lawn and would deliver water to it in the desired manner. Lawn sprinklers do not come at a low cost and their installation tends to cost a long time as well. Therefore, this is not something that you would be able to do again and again. Thus, it is important to make the correct decisions the first time around. A lawn that incurs damage cannot be cured easily. Hence, you should ensure that you take all the required measures that would keep lawn diseases and similar other problems at bay. Purchase a lawn sprinkler that is of profound quality and is suitable for your lawn. You would not want to lose the beauty of your lawn due to your negligence. A little bit of attention is all that is required. Once you acquire an understanding of the sprinkler system, there is not a lot that you would have to do as the lawn sprinkler would take care of it all.